The Gospel reading on February 24 was from Luke 8, 22-25. At St Mark’s that day, Lesley Shatwell preached. That’s a good question. And what is faith anyway? It’s easy to believe something if you can see it to be true. The disciples witnessed how Jesus was able to calm the storm, so they came to believe. But is that the same as faith? I don’t think it is. It’s not something we can force in ourselves and it is something which we can lose just at that very moment when it could be useful. Just at that moment when you are all at sea in a storm. Loss of faith doesn’t have to be so dramatic though. I think a lot of us are looking for a quick fix. Something which will make us feel safe and secure, loved and well cared for. And perhaps it seems that God offers this. All will be well, if I just had a bit more faith in God … and perhaps it would, I’m certainly not going to dismiss people’s faith, but at the risk of being less than a “sunshine” Christian, I can’t offer it to you that today. That’s a quick fix. It doesn’t take into account that plain fact that none of us can force ourselves to believe in God. I can look with wonder and a fair dollop of jealousy at people whose faith can move mountains, and yes, I probably envy them, but it is not my experience of being Christian. There are some days when I wake up and I know, without a shadow of a doubt that Jesus is my saviour. That wonderful aria from Messiah, “I know that my redeemer liveth …” is playing like a constant companion in my mind and the joy of the Holy Spirit runs right through me. Then I catch a glimpse of the outrider clouds of a massive storm and all those wretched doubts creep in. Life is tough. Lots of people have things far more tough in life than I do, but, dear Lord, this is me and there are times it feels as though I am totally alone and lost in a storm at sea. I long for Jesus to wake up and make everything better for me. But it hasn’t happened yet. But before I wallow too much in the awfulness of everything, I must be honest: there are good times along with the bad times. It’s God’s doing, even though it may seem as though God is asleep and letting me get on with my life, I have to acknowledge that my joy is not entirely down to me. God has given me a wonderful day and it is at times like that when I sometimes remember to give thanks and show my gratitude. Often I don’t, because I’m human and I accept the good times which come to me as though I have a right to them. It’s different though when things go wrong. Have you ever had days when you wake up with a feeling of dread as to what is going to happen now you have come out of the dreamland? Have you ever had days when everything hurts, everyone you meet seems to rub you up the wrong way so it would have been better if you had avoided people? Yes, people, they are the problem; no, it’s my tummy, I shouldn’t have eaten that great big dinner last night; oh my back aches; no, it’s that awful meeting I’m going to have with my boss – yes, I knew it, everybody else is the problem. Always someone else’s fault. Probably God’s fault. Everybody else is happy and well and I’m not. God this isn’t fair, why have you forsaken me? What have I done wrong? Wake up God! We call on God a great deal more to sort out our problems than we do to give thanks and praise. It’s when disasters happen that we wonder where God is and why he has abandoned us. Where was God during the tsunami? Where was God when evil people get into power? Why didn’t God stop that child from being hurt? Yes, God – where are you? Why are you asleep in the back of our boat as we are sailing head-on into a storm? Wake up Jesus! We need you here now. In our reading today, we hear about experienced fishermen who made their living going out in boats. And they were terrified, they thought they were going to die. They were out of their depth as the gale swept down on them and the waters poured into their boat. All their own effort and skill couldn’t save them. All the while, there is one person, their friend who sleeps through it all. He is with them though. He’s not left them. He’s in the boat with them. At the point in the gospel where this passage occurs, they are just learning who Jesus is. They need more reassurance before their faith is strong enough to realise that because Jesus is with them in the boat, whatever happens, they are safe in the loving care of God. The winds and waters obey Jesus, for God created all things. By calming the storm and saving their physical lives, Jesus is not forcing them to have faith, he is showing them again that he is with them. In our lives there are plenty of storms when it seems that God is asleep and not aware of our troubles. Despite what it feels like, that’s not so, for God is always with us – as the final words Jesus says according to the Gospel of Matthew: “And remember, I am with you always, to the end of the age”. Perhaps he is asleep but I don’t happen to think so. And anyway, what I do know is that Jesus is most definitely in the boat with us. Picture: Christ in the Storm on the Lake of Galilee by Rembrandt. This led me to reflect on the Synoptic Problem. When I was training the predominant theory (simply put) was that Mark was written first, then Matthew, based on Mark and then Luke based on both. However, one of my lecturers discussed the theory that Luke preceded Matthew. This appealed to me as someone who likes things categorised; that Luke told stories and then Matthew rearranged them into more organised blocks. Jesus answered him, ‘It is said, “Do not put the Lord your God to the test.”’ When the devil had finished every test, he departed from him until an opportune time. Matthew had an extra “but by every word that comes from the mouth of God.” to the first response. The order of the temptations is different. If Matthew wrote first then why would Luke remove the second half of the quote? If Luke wrote first, then Matthew (as a Jew writing for Jews) might have included the second half of the Old Testament quote as he already knew it, and knew that it would point his readers to a known reference. Why would Luke change the order of the temptations if Matthew wrote first? I am sure you may come up with your own answers, but if Luke wrote first Matthew might change them so that they reflect a movement from the personal, to personal aggrandisement to power. I am far from an expert in these matters, but from time to time I like to think about these things! Luke 14:26 ‘Whoever comes to me and does not hate father and mother, wife and children, brothers and sisters, yes, and even life itself, cannot be my disciple. Happiness cannot be found by seeking it – unhappiness is caused by our false beliefs about what makes us happy, and these are so ingrained by society that we are not even aware that we have them – like a dreamer in a dream. Once we realise that attempting to please others will never bring us happiness we can start to understand this. Not trying to please others is difficult. I write this as someone who got a career because that is what you are expected to do after university. It was all very pleasant, passed the time nicely, paid the mortgage, but wasn’t what I was called to do. As I changed my life, discovered my vocation, left the career, stopped worrying about what the world might think (at least sometimes) I found a deeper happiness. But – it was a scary process! Who are they – name them? So John the Baptist is born. They are going to name him after his dad, but his mum says “no – his name is John”. They don’t believe her and so his dad writes on a tablet that his name is John and they believed him. I would venture that if you are not annoyed then you are probably male! I moved house a little while back.. moved to a cottage in Wheatley. Before we moved my prime task was to make sure that my internet connection was going to be available on the day that I moved in. I did everything by internet – banking, chatting to my mates, working from home, finding out information… it was vital to me. So I rang up the week before we moved, and did everything they asked, and rang up on the day we moved, it should be all set. When we got there the phone didn’t work, and so we arranged for a service engineer to come in a couple of day’s time. He said that the line had been accidentally cut by the previous occupant being rather zealous with some shears on the bush around the door and he would put a new line in. He put a new box inside the cottage and took his cable outside but discovered that there was no way he could get it to the pole as there were trees in the way, and hence it needed to go under the road. I was dismayed… it had already been two days and there was going to be a further delay. He sensed my desperation, and booked the work in urgently and taped the coil of cable to the side of my cottage. It was actually 115 days before we got our connection back and I won’t bore you with the whole story, but in the middle of this saga I rang up BT for the hundredth time to be told that the engineer had in fact connected the cable and there must be a problem with the exchange. I told him that the engineer had not connected the cable and it was still taped to the side of the cottage… at which point he said it wasn’t and the engineer had been and it would take a couple of days to trace the problem at the exchange. I then said that the engineer had not been because I could see with my own eyes the loose end of the cable. At this point the man on the end of the phone told me in a patronizing tone that I shouldn’t worry about it and they would soon sort it out at their end. In desperation I passed the phone to my husband who said ‘the cable is still coiled up and taped to the side of our cottage’, to which the man on the end of the phone replied ‘ok sir, I’ll send an engineer to sort it out’. As a woman it is sometimes hard to be heard, sometimes hard to be treated as an equal. And I feel that, living in the 21st century in England… how much harder it is for women across the world and across the ages… how much harder it must have been for the women in the Bible. I heard a talk given by John Bell at Greenbelt a couple of years ago…. He was asked to preach at Westminster abbey at Evening Prayer and was given a sheet with the readings on it. He thought it would be interesting to see what had been preached on at Morning Prayer. So he found that it was Exodus 1:1-12. This text is about how a King rose up that did not know Joseph and oppressed the people by making them work hard. John Bell’s text was Exodus 3:1-12, which is about the call of Moses. Now he was intrigued that so much of the text had been skipped over and looked at what the missing stories were. There was the story of how the King had decided to get rid of all the Israelite boys, and he called in the midwives, two of which were called Shiphrah and Puah, and told them to kill the male children of the Israelite women. However, they disobeyed this command. So, when the King looked out of his window and saw all the little Israelite boys running around who should in fact be dead, he called them back in for an explanation. They said oh, the Israelite women aren’t like Egyptian women, you know. Oh no – Egyptian women make such a fuss, in labour for 28 hours, but not the Israelite ones, a huff and a puff and the baby is out before we can even get there. Guess what – God was so pleased with these two women who disobeyed the Pharoah and lied to him that he blessed them with lots of kids. Then there was the story of how Moses was born and hidden until they could hide him no more, so his mum made a basket and put him in it, then his sister kept watch, and then the Pharoah’s daughter found him and took him in. Another story where three women are active in defying male authority and that gave rise to Moses, the saviour of the Israelites. When John Bell got up to speak in Westminster Abbey he said that he was sorry to announce that between the 11.30 service of Morning Prayer and the 4.30 Evensong, five middle eastern women had gone missing in the abbey. This caused a certain level of blind panic amongst the security people. I could go on about other women in the Bible – courageous women – dispelling the image that all women in the Bible are either virgins or whores… women who stood up to Kings, stood up for justice, defied husbands, ignored gender stereotypes and challenged Jesus. These are women that God did not denounce, but God rewarded them. Why? After all natural selection favours the fittest. When we look for examples to follow, we look for the best – the most successful. What is it about the weak, the downtrodden, the poor, the women, the outcast. What is it about loving them that is good? Obviously, I don’t know. I don’t know the mind of God. But instinctively in my spirit I know it is true that God reaches out to the broken-hearted, the broken reed – God will not snap, the guttering flame – God will not extinguish. And I also think it is true that in loving that which is weak, loving the despised and broken outside of ourselves, we begin to love that which is weak and broken within ourselves. Jesus said that he came to give Life and Life in its fullness, the only way we can be fully alive is if we fully accept the whole of ourselves. When we live without fear or shame. More than that, though, I believe that Life in all its fullness involves courage. And so many places where God commends the weak, it isn’t just that they were weak, it is they acted with courage in spite of their lowliness and weakness. I have been told by a psychologist that there are two themes in the Bible, the first is God saying “I love you”, and for you and me, perhaps there are parts of us that are weak or despised that we find hard to accept are loved. Hence when Jesus loves the Leper or the adulteress we find it easier to accept that we are loved too. The second theme is God saying “Grow up”. And whatever the situation is – an overbearing Pharaoh to stand up to, an unjust King, whoever, perhaps the weak in the Bible can show us that however overwhelming the problem, God is with us and we need to get on and face it. Perhaps it is no wonder that the women were first at the Cradle and last at the Cross. They had never known a man like this Man. There never has been such another. A prophet and teacher who never nagged at them, never flattered or coaxed or patronized; who never made arch jokes about them, never treated them either as “The women, God help us!” or “The ladies, God bless them!”; who rebuked without querulousness and praised without condescension; who took their questions and arguments seriously; who never mapped out their sphere for them, never urged them to be feminine or jeered at them for being female; who had no axe to grind and no uneasy male dignity to defend; who took them as He found them and was completely unself-conscious. There is no act, no sermon, no parable in the whole Gospel that borrows its pungency from female perversity; nobody could guess from the words and deeds of Jesus that there was anything “funny” about woman’s nature. 15When the angels had left them and gone into heaven, the shepherds said to one another, ‘Let us go now to Bethlehem and see this thing that has taken place, which the Lord has made known to us.’ 16So they went with haste and found Mary and Joseph, and the child lying in the manger. 17When they saw this, they made known what had been told them about this child; 18and all who heard it were amazed at what the shepherds told them. 19But Mary treasured all these words and pondered them in her heart. 20The shepherds returned, glorifying and praising God for all they had heard and seen, as it had been told them. And we were able to watch it again this week. I enjoyed it possibly even more than the first time through. It is just one of those subjects that compel us to return again and again. They are beyond our comprehension. to make more comprehensible the wonders of the universe that are so hard for our imagination to grasp. To illustrate the forward motion of time. The way space/time is curved by the gravitational pull of the fabric of the universe illustrated by the beautiful peaks and troughs of a snow covered mountain range viewed from above. One of the wonders of Our God that we celebrate at Christmas time is that the Creator of the Whole Universe comes to live among us here on this little planet earth. What’s more, he is born as a vulnerable little baby with only an animals’ manger for a cradle. The paradox of our faith, God becomes human. We just can’t get our minds round it. 2000 years ago, when the angels appeared to the shepherds and told them to go to Bethlehem to see “the Saviour, who is the Messiah, the Lord” (Luke 2:11). They didn’t doubt their own senses, but went straight away to Bethlehem and found the baby. The meeting with baby Jesus had such a profound effect on them that they couldn’t keep it to themselves but spread it to the whole town. but the encounter with the baby. You might have expected the visit by the angels to have filled the shepherds with such awe and wonder that they couldn’t help worshipping God. After all, it isn’t every day that you’re visited by a heavenly choir who relay a direct message from God. 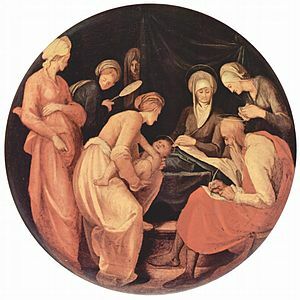 But although you might easily see a baby every day, it was actually the baby that set the shepherds aflame for God. incapable even of smiling because he was so young, there was still something so special about him that it made the shepherds spread the word concerning him and return glorifying and praising God. The shepherds could perhaps be described as the first evangelists, as they were the first people to tell others about Jesus. which is perhaps fairly unusual behaviour for a mother. Many mothers can’t wait to sing the praises of their children, and tell anyone who will listen all about their child’s remarkable qualities. But for Mary it was too important and too deep to be casually tossed around in idle chatter. Mary treasured up all these things and pondered them in her heart, using them as the precious basis for all her future thought and way of being. So Mary too was changed by her encounter with the baby. someone just like us, familiar to us all. he is God with us. power to become the adopted children of God, and call him Abba, Father.